Bali Underwater Scooter watersport, which gives the sensation of driving with a scooter under the sea. 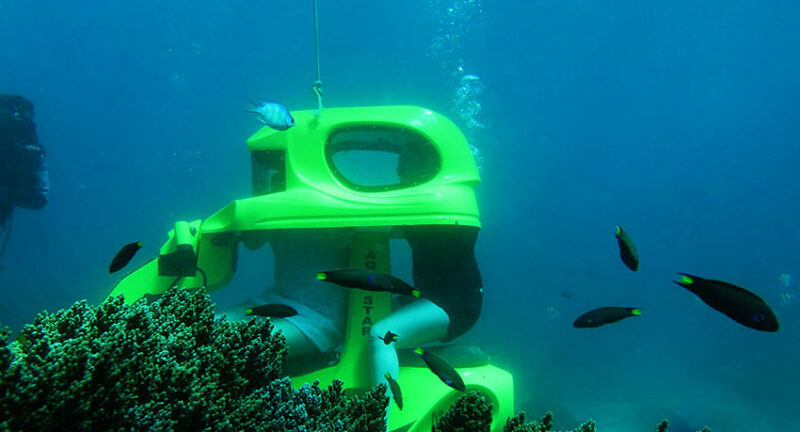 You will feel how to walk with a scooter vehicle under the sea, of course this will provide a unique and new experience while traveling with your spouse or family. Underwater Scooter is one option that does not require special skills, because during the game you ride a special vehicle under the water. The scooter vehicle include oxygen cylinder used by the player for breathing. How to operate the underwater scooter is very easy, it only takes a few minutes you can control it. By controlling the device with a button you can walk and stop according to the controls you want. Bali Underwater scooter has two engines, one machine for advanced and the other for upward movement. Drive button is easy to reach by the driver, there is the right and left hand wheel. For underwater scooter speeds only around 5 km / h and can not be as fast as a scooter on land. While the depth of adventure underwater scooter only 4 meters deep, so that the scooter does not hit the coral. To ensure safety and comfort, every diving is followed or accompanied also by a professional diver guide. Underwater world that is rarely accessible to ordinary people. Now you can more easily to see the underwater scenery with underwater scooter Bali. This Bali watersport is specially designed can be enjoyed by children and also adults. Enjoy your underwater adventure tour with more sensation and deserve to be remembered and immortalized. Complete your trip with Bali A1 Driver, we choose beautiful places that are popular in Bali specifically for you. With comfortable cars and also professional and experienced drivers, we will take you to Bali’s exciting destinations. More information Underwater Scooter Bali Tour you can contact us or visit our website www.balia1driver.com to see another beautiful place in Bali.